The Ontario Volleyball Association (OVA) is pleased to announce that a Tryout Window will be in effect for the 2014-2015 season. The OVA underwent an extensive consultation process to evaluate the benefits of implementing a Tryout Window. This process took over a year and included feedback from the membership collected through online surveys, as well as an in-person Town Hall meeting. An Ad Hoc Committee was formed to review the Tryout Window proposal, review the membership’s feedback, determine if the proposal should be adopted, and to set the policy’s dates and parameters. To alleviate stresses on clubs, athletes and families. To provide all clubs with an equal opportunity to select players. To provide families with an opportunity to gather information and explore options. To provide time for families to make an informed decision. 70% of the membership surveyed felt that a Tryout Window was “extremely necessary”. To define the season of play for indoor club volleyball. SEASON OF PLAY: The Ontario Volleyball Indoor Youth Competitions season of play begins on the Saturday after Labour Day and ends on May 31 of each year. TRYOUT WINDOW DATES: Club tryouts may not commence until September 6th, the Saturday after Labour Day. The Tryout Window will end at 11:59pm on Friday, September 26th. A tryout is defined as an event where a club has communicated, in writing, that athletes will be selected to the club. RE-SIGNING: Clubs have the option to sign athletes returning to their club from the previous year between August 25th and 11:59pm on September 5th, the day before the tryout period begins. A returning athlete is defined as a registered OVA member with the club during the previous year. As of September 6th, those athletes who did not re-sign with their same club are able to tryout for another club team (and/or their old club). Clubs and athletes are not obligated to utilize the early signing period and may continue to use the tryout period to explore all options. SIGNING: Athletes who have not re-signed with their previous club cannot sign with a club until the September 27th Signing Date. OFFICIAL COMMITMENT: The athlete and parent/guardian must sign the OVA Membership Waiver form to make an official commitment to the club. No further communication or contact from other clubs can be made with an athlete once they have signed. The athlete is committed to that club for a minimum of one season (Signing Date through May 31). ATHLETE COMMITMENT: Athletes are free to tryout for any team until they have officially signed with a club. Athletes are committed on a yearly basis and are free to play with another club or team the following season. CLUB FEES: Clubs may not collect any deposits for club fees until the end of the tryout period, excluding a tryout fee. Athletes that re-sign with a club may be asked to submit club fees when they re-sign. CAMPS AND CLINICS: Clubs will be permitted to facilitate clinics & camps in the off-season (June 1-September 8). VERBAL COMMITMENTS: Verbal commitments made at any time are strictly informal. 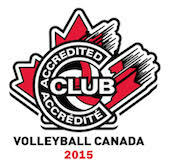 Signing the OVA Membership Waiver form is the only binding contract recognized by Ontario Volleyball. In many areas school gyms are not available during the first week of school. Beginning a week after school starts offers clubs a chance to promote their tryouts to students. The selected dates were the most popular dates identified by the membership survey. Provided enough time for clubs to communicate with their potential returning players. Provided clubs with time to consider each team’s needs with regards to returning players and to organize their tryouts accordingly. Verbal commitments are allowed due to the difficulties involved with enforcing violations. Fine of up to $1000. Suspension for up to one year from all Ontario Volleyball events, beginning from the date when the investigation concluded to the individual, team or club. Indefinite suspension from Ontario Volleyball events, beginning from the date when the investigation concluded to the individual, team or club. Individuals, teams, or clubs suspended for more than one year must apply in writing for reinstatement as a member in good standing. Approval for reinstatement will be contingent upon a full review of the application by Ontario Volleyball. An individual, team or club may appeal a sanction through the Ontario Volleyball Appeals Policy.